Last summer San Francisco intactivists made international headlines when they introduced the San Francisco Male Genital Mutilation Bill, a ballot initiative to safeguard sexual and religious freedom by protecting boys from non-consensual circumcision. In a move to stall this effort, California state Senator Mark Leno co-authored AB 768, a bill which forbids any city or county in California from "[restricting] the practice of male circumcision, or the exercise of a parent's authority to have a child circumcised." His cutting crusade is beginning to attract a backlash from human rights advocates who view the Senator's actions as an attack on men's genital autonomy. Last month during a picture-hanging ceremony in his honor, Senator Leno was met by a protester who condemned the Senator's actions as sexist, shameful, and sexually respressive. This event caught the attention of intactivist filmmaker James Loewen who interviewed the protester and crafted the video "An Open Letter To Senator Leno". Fueled by the Senator's refusal to respect men's right to bodily integrity, members of the human rights group Bay Area Intactivists planned and promoted a rally for freedom from forced genital cutting. 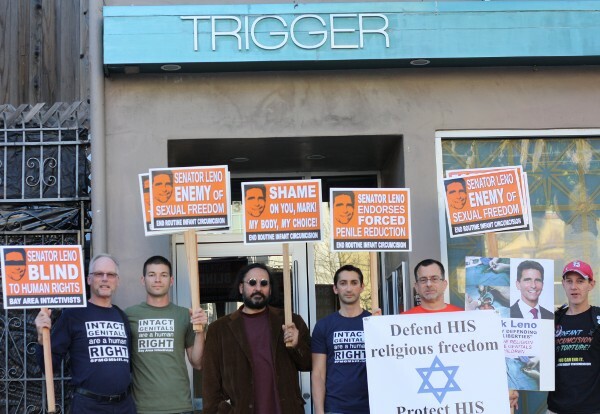 Protesters gathered in front of club Trigger on Friday, April 20, during Senator Leno's re-election campaign fundraiser. Their bright signs with messages such as "Senator Leno: Blind to Human Rights" and "Senator Leno Endorses Forced Penile Reduction" caught much attention during the course of the three hour protest. While Senator Leno said very little to the intactivists during his hurried arrival and departure, he got a strong reminder that his failure to protect the most vulnerable members of our community has not gone unnoticed.